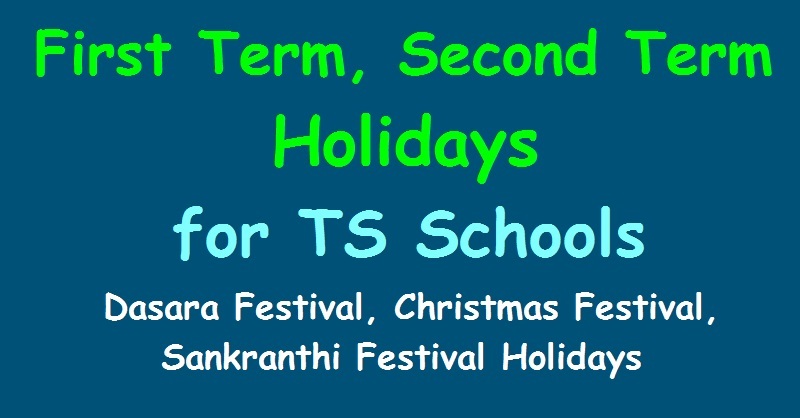 First Term holidays, Second Term Holidays For TS Schools for 2018-2019, First term and Second term Holidays for the Academic year 2018-2019, PROCEEDINGS OF THE DIRECTOR OF SCHOOL EDUCATION, TELANGANA, Rc.No. 405, SCERT, Telangana, Hyderabad - Implementation of Academic Calendar• Strict implementation of academic calendar and observation of 1st term holidays (Dasara holidays) from below mentioned dates in all the schools under State Government i.e., Government and Private Aided Schools-Orders issued. Dussehra vacations were announced for schools in the state in October(13 days). The Director of School Education, has suggested to the education department of the districts to take this action. All private schools are also required to implement this and ensure that they do not have to be strictly committed. Schools will resume from October five. Intermediate officials from Dasara holidays to junior colleges in the state. All the RJDSEs and DEOs in the State are hereby informed that vide subject cited the Academic Calendar was communicated to all the Government and Private schools in the State. As per the academic calendar 1st term holidays (Dasara holidays) are from 09-10-2018 to 21-10-2018 for all the schools under State Government i.e., Government, Government Aided and Private Aided Schools. In this regard, it is observed that some of the managements of private schools are not following the academic calendar and running the schools during the Dasara Vacation. The DEOs are instructed to take this issue seriously and take immediate action as per the rules in vogue. Instruction may be issued to all the DyEOs, MEOs to monitor the closure of all types of schools for Dasara Vacation i.e., from 09-10-2018 to 21-10-2018 and issue circulars to all private schools to follow vacatioin and other matters as p:r the academic calendar communicated. DEOs are also directed to issue a press release in the local dailies for the strict observations of Dasara Vacation and serious action may be initiated for deviation if any against the managements.